Alexandre Kojève (1902-1968) was an important and provocative thinker. Born in Russia, he spent most of his life in France. His interpretation of Hegel and his notorious declaration that history had come to an end exerted great influence on French thinkers and writers such as Raymond Aron, Georges Bataille, Maurice Merleau-Ponty, Jacques Lacan, and Raymond Queneau. An unorthodox Marxist, he was a critic of Martin Heidegger and interlocutor of Leo Strauss who played a significant role in establishing the European Economic Community; a polyglot with many unusual interests, he wrote works, mostly unpublished in his lifetime, on quantum physics, the problem of the infinite, Buddhism, atheism, and Vassily Kandinsky's paintings. In The Black Circle, Jeff Love reinterprets Kojève's works, showing him to be an essential thinker who challenged modern society and its valuation of individuality, self-interest, and freedom from death. 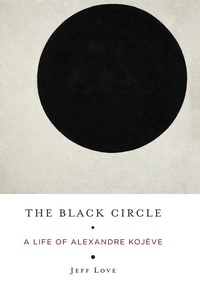 Emphasizing Kojève's neglected Russian roots, The Black Circle puts him in the context of the late-nineteenth- and early-twentieth-century Russian debates over the proper ends of human life. Love explores notions of perfection, freedom, and finality in Kojève's account of Hegel and his neglected later works, clarifying Kojève's emancipatory thinking and the meaning of the oft-misinterpreted "end of history." Combining intellectual history, close textual analysis, and philosophy, The Black Circle reveals Kojève's thought as a profound critique of capitalist individualism and a timely meditation on human freedom.